Every year without fail the Thanksgiving Day Parade in New York City takes center stage. It’s become a tradition for families to tune into to watch the big balloons float down the streets, gaudy parade floats with people waving on them and endless marching bands. Of course the TV networks cover the action to bring to viewers. 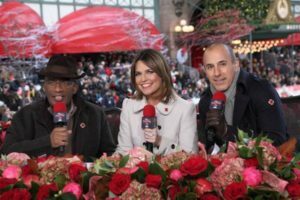 NBC gets the important distinction of being able to advertise their morning broadcast as ‘The Macy’s Thanksgiving Day Parade’. 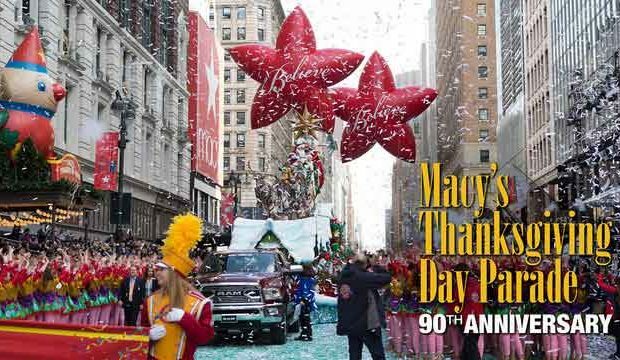 I guess they have the exclusive deal with Macy’s to use their name in the title and get a prime spot to set up on the parade route, while other networks are forced to just say ‘Thanksgiving Parade’. I don’t think there’s any copyright on those two words. I am not a parade person at all, but somehow this holiday tradition of tuning into the parade has infected me, so once again I turned the coverage on in the morning. Oh it wasn’t necessarily to check out the joyful festivities that are being unleashed onto the city streets, but to try and comprehend how this annual television broadcast of this parade is so badly done! It has to be the worst produced broadcast of any annual event – and it just gets worse every single year. I imagine for those who look forward to watching this parade on television they….you know….want to watch the parade. They want to see the people, floats and balloons being marched down seventh avenue. But somehow NBC and CBS – the two networks I was flipping back and forth in-between – don’t really care what their excited parade viewers want to see. They have their own agendas, which is to use the parade as simply a backdrop for talking head interviews, horrible lip-sync performances and to promote Broadway shows and corporate sponsors every chance they get. It’s a rare stroke of luck if they turn the cameras around to the marching on the streets for viewers to see what’s happening. I’d love to see a study done analyzing just how much out of the three-hour parade broadcast is actually parade footage viewers get to see. It’s gotta be a low pathetic number. I don’t think any of this broadcast is worth watching, but thanks to it becoming a ‘tradition’ people continue to tune into it by the millions to watch it while the networks use this event to hype up their own shows, talk with random celebrities in the broadcast booth, have Broadway casts dance and to showcase as many corporate sponsors via floats or commercials as they can manage. It’s truly a horrible broadcast. I will never understand the dance numbers. In my mind one of the defining attributes in a parade is walking. People ‘walk’ down the street, they march, they keep things moving! It’s a parade! What is this – everyone stops to do a dance routine from a musical stuff? Good Grief indeed Charlie Brown! 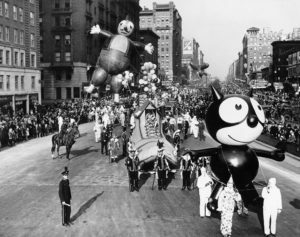 The kids who are sitting in front of their televisions – probably groaning at how boring this is – who are hoping to see something fun are lucky if the networks actually show the Felix the Cat balloon whizzing past. I know when this parade began it started as a commercialized way for Macy’s to promote their upcoming holiday shopping season. But at least it must of been entertaining for folks to sit through. They tried to package it in a way by saying, ‘ok this is a big commercialized event, but the kids will have some fun watching the big balloons and floats and stuff’. These networks…..don’t try to hide the intentions of it in anyway. They don’t give the TV audience anything – other than ads and promotions for crap! It’s amazing! It’s like when you’re on the internet and you keep trying to close pop-up ads so you can read or watch something – that’s the Macy’s Day Parade coverage! You keep hoping they’ll take a break from the commercials, logos and promotion so you can get a glimpse of some of the parade, but unfortunately you’re not able to close or skip any of crap they fill our television screens with. So, we’re forced to sit through horribly written banter between the hosts as they set up the next musical number or random interview with someone associated with their network. Meanwhile, in the background the marching parade is chugging along without viewers being able to witness it. I’ll never understand why someone, some station, some entity, hasn’t come around yet and has done some decent coverage of this parade. The old parade broadcasts were never as grueling to sit through as nowadays. The major networks stink! It doesn’t seem complicated – you just lock one or two cameras off, point them at the street, film what walks past them and bam you have your parade coverage! I think NBC started doing some streaming thing with the parade and I imagine it has to be better than the television broadcast where viewers are forced to listen to the hosts trade insipid jokes back and forth for three hours. I wonder if people will ever get tired of watching this awful coverage or will they just keep tuning in year after year just because it’s a ‘tradition’ and won’t demand more quality from it. It seems like it’s the easiest thing ever to just film a parade. I’ve seen cable access television stations cover their local town parades better than what NBC and CBS do every year. It’s like screwing up a filming of the Yule Log or something. It’s very simple! If the networks got their hands on that they’d probably screw it up too. They’d probably carve corporate logos onto the burning logs and instead of playing Christmas music just play an endless rotation of sponsor jingles. Come on folks! This parade coverage is embarrassing! The families tuning in around the country deserve better than this! A newsreel of the parade from 1935 – and it’s better than what viewers get now! YES!!!!! I agree! The TV coverage is HORRIBLE on all stations. Who cares about interviews and lip-synching performances? Why not show the actual–you know–parade? That’s why I’m tuning in. Correction: Why I’m turning it OFF. Yeah, it’s terrible! They kept updating you on where the parade is without actually showing it. I don’t care about anchors, sponsors, singers, musicals and dances when I want to watch a PARADE! I finally gave up on the broadcasting channels and managed to find a live stream on YouTube that was so much better. You could see all of the floats from the perspective of being in the crowd, and it was like actually being there! That’s what I plan to do from now on.